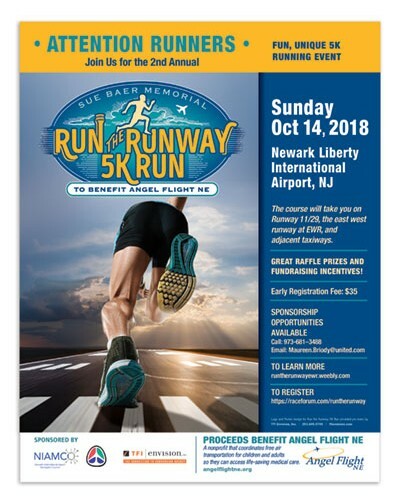 TFI Envision Creates New Logo and Poster for 5K Charity Run at EWR | TFI Envision, Inc.
Newark, NJ — The Susan Baer Memorial “Run the Runway” 5K Run is an annual event held in honor of Susan Baer to raise funds and awareness for charities that are making a difference within our communities. The Newark International Airport Managers Council (NIAMCO), with the coordination and support of the Port Authority of New York & New Jersey (PANYNJ), is proud to hold this event at the Newark Liberty International Airport (EWR). Sue Baer, an aviation pioneer, former General Manager, leader, friend and mentor at EWR is NIAMCO’s inspiration for this event. The cooperation and coordination with the PANYNJ is essential to this event and together they have embraced the challenge. The course will take runners on Runway 11/29, the east west runway at EWR, and adjacent taxiways. Angel Flight Northeast has been chosen again this year as the charity of choice for this annual event to be held on October 14, 2018 at Newark International Airport in New Jersey. TFI Envision was asked to develop a new logo and poster for this exciting event. “We wanted to capture the ‘sense of place’ in the creative execution of both the logo and the poster…the excitement and energy of actually running on a runway! We’re also looking forward to helping to promote this event and having some of our team members running in the event.” said Elizabeth P. Ball, President and Creative Director of TFI Envision, Inc.